Have you been to Hershey Pennsylvania? This town is known as the “Sweetest Place” on earth and popularly called the “Chocolate Town, USA”, another awesome destination that should be in the top of your travel list. Interesting and educational places to visit are the following: the GIANT Center which is home of the Hershey Bears; the Hershey's Chocolate World which is open year-round; Milton S. Hershey Mansion which is in the National Historic Landmark and the Hershey Museum which is about the life and legacy of Milton S. Hershey. 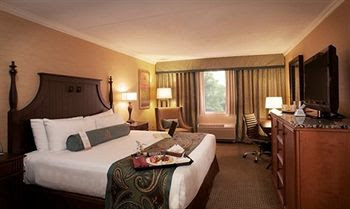 To do all these itineraries, a relaxing place to stay is the grand hershey lodge shown in the photo below. What a great serene view isn't it? 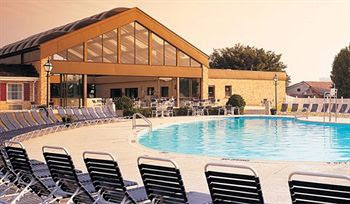 The resort has 665 guest rooms and can accommodate a large event for it has a huge function space.If you are looking for value, convenience and easy access to all the attractions that I mentioned above then, this place is a great resort to spend a fun vacation with your family and love-ones. All over the resort, they have braille signage which is very heart-warming to know. Now, how many resorts offer this type of pleasant amenity? I tell you that it is very rare and I applaud them for having the braille signage in the resort. They offer valet parking and if you need anything, their concierge will handle it professionally for you. Hershey Lodge guest rooms and deluxe suites have the great ambiance, cozy, relaxing, and have the amazing chocolate-themed decors and artwork. Guests can choose from either a king size bed or two queen size beds and I always prefer the latter. How about you? Do you find this guest room relaxing and soothing to stay? Start planning your vacation today and take Hershey Pennsylvania as a must travel destination this year. I have never been to Hersey, PA but you have just made me want to go! That hotel looks mighty inviting--and what I just learned is you don't actually have to have kids with you to enjoy some of the museums etc that are there!! I would love to visit Hershey some day! That lodge looks spectacular. We haven't been there but hubby and I are planning to take the kids there even for just a day.